The director of CFIE together with the head of Teacher Training Programs, Víctor González, gave a speech on the importance of internationalization of teacher training centers and how strategic partnerships are vital to contribute to improve continuous and professional development. He mentioned that after a year, the project is a strong consortium and the experiences gathered are enriching the school communities in the four countries. We welcomed partners and the team of advisors from CFIE. Following the agenda, the four partners presented the different training processes related to mobile learning that has been implemented in their countries and plans of improvement. 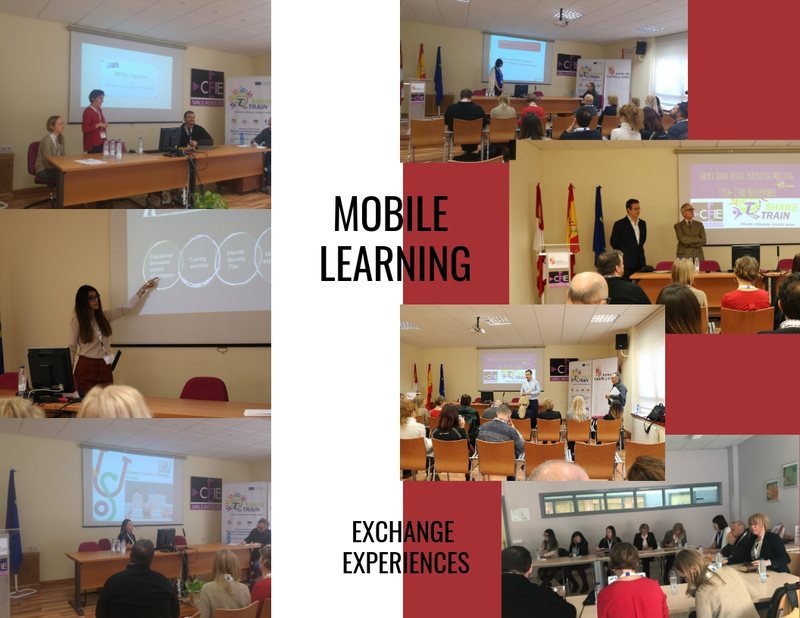 Each partner delivered a 20 minute- presentation followed by a debate on the main points presented: projects and activities, carried out in schools in Valladolid, Opole, Kaunas and Bordeaux and proposals for improvement and future expectations regarding mobile learning. During the coffee break we had the opportunity to exchange experiences and common fields of expertise among the partners and the team of advisors in CFIE and networking. After the break, the leading committees of the four institutions met to deal with the coordination of the activities stated in the agenda and define action plan to disseminate the activities and jobshadowing taken place. The definite English version of the web site was presented. It was also highlighted the importance of contributing with quality experiences and the enriching experience of using different languages. As most of the digital documents are visual and nowadays automatic translation make it much easier language is not a barrier anymore and it is not mandatory to translate every document and video into English. Nonetheless, English is the main language as most of the literature of the subject is in English. Partners agreed that the dissemination is paramount and that it should be included in the agendas of their institutions. After such intense working sessions, the partners met for lunch and in the evening they enjoyed a guided tour around town. 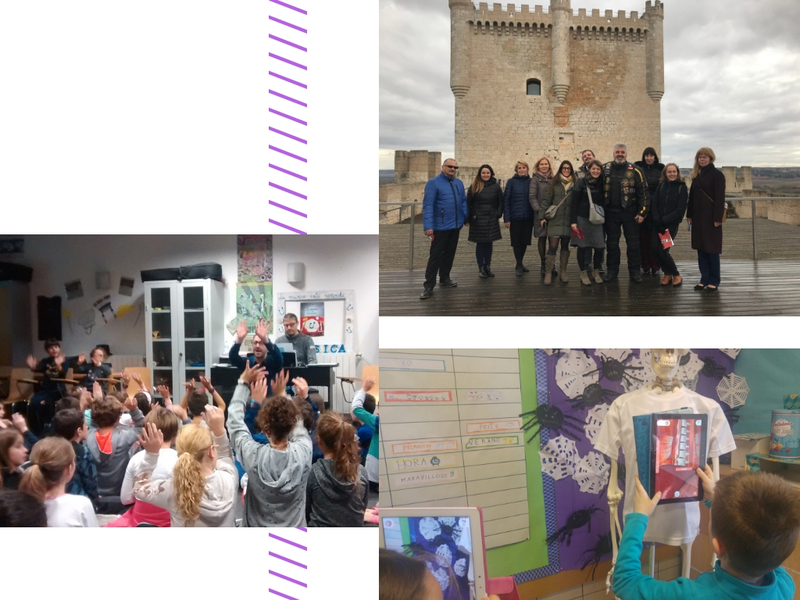 Following the agenda, the morning was devoted to visits to two High Schools : IES Las Salinas and IES María Moliner. The Head of IES Salinas and coordinators of the REVER project welcomed the partners and presented the general guidelines of Rever Project. Teachers and students presented the key elements of the project and how transforming learning spaces and methodologies can change education. At the moment teachers are participating in several projects and are also taking part of a Training Plan designed by CFIE to learn how to implement PBL in a cross curricular way. During the coffee break partners and staff of IES Salinas had the chance to network and exchange experiences. It was an interesting session as members were very interested in knowing more about the projects they were involved. The next visit was in the same town, Laguna de Duero. At midday we visited the IES María Moliner. The Head welcomed us and explained the general teaching and learning projects they are following regarding mobile learning. We had the chance to see on the spot a group of students who were studying the First World War. They were editing an eBook that will be published. The project is a multimodal project and students have the opportunity to show us how to use the different media ( video, audio, radio recording, podcasts, mindmaps,graphic organizers etc). After observing the students using mobile devices in the Geography and History class, we had a Training Session with Mr. Ignacio Martín Jiménez. He explained the workflow he follows. The model is based on 4 key approaches: Cooperative learning, flipped classroom. Thinking Based Learning (TBL) and graphic organizers and neurocognitive theories. The use of technology as a tool and the importance that first is the methodology and then the technology. After the presentation partners discussed some of the points presented and were interested in how to implement this approach successfully. After the visit to the school the partners enjoyed a working meal together in the village of Simancas and spend the rest of the evening visiting Simancas Archive where we were showed around the facilities and had the privilege to see some old documents from Poland, Lithuania and France. The third Training Seminar, Gamification and Escape Room Edu, was conducted by Ms Clara Cordero, an expert on Gamification in Education. Partners and CFIE advisors participated in the workshop. We learned by doing. First, we knew how to design a Breakout Edu and the workshop was followed by a session on Game Based Learning (GBL). Working in groups, participants examined the different games and proposed ways to improve the mechanics and other elements to adapt to the classroom. We finished by assessing the different tools and games and ways of improving and readapt to different levels. After the coffee break, partners had meetings with CFIE advisors. Each department explained the priority lines and projects they are leading. After the visit to the school the partners enjoyed a working meal together and spend the rest of the evening visiting Miguel Delibes Auditorium where we were showed around the facilities and observed some dancing classes led by the director of the institution. On Thursday we visited two primary schools that are leading the use of mobile devices, PBL and gamification. The first school to visit was CEIP Kantica. The school is a leading in the area regarding gamification, PBL, music and bilingual programs in English and Spanish. The head and two teachers presented the main objectives of the school and how working in projects is basic. The school is taking part in a Teacher Training Plan designed by CFIE which focuses on PBL and assessing the core skills. During the coffee break partners exchanged views and talked about future partnerships with some of the teachers. The second school to visit was CEIP Margarita Salas. 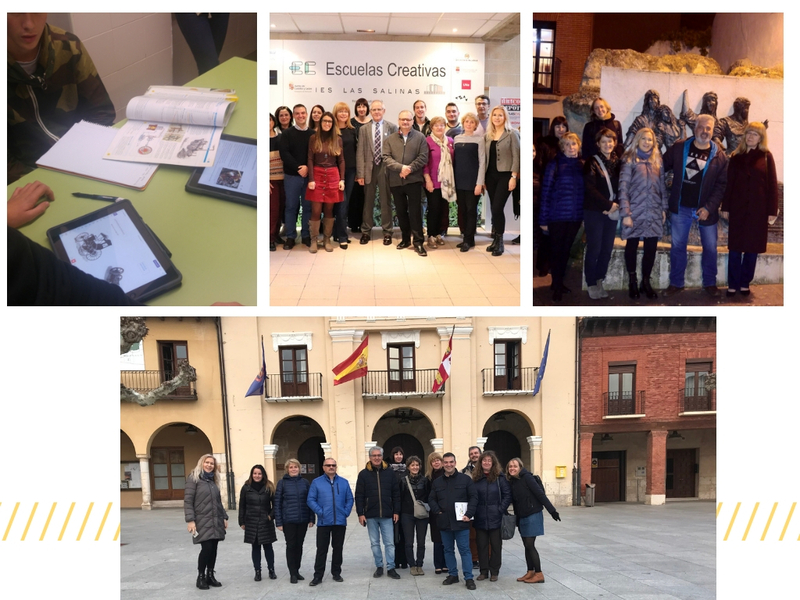 The head of the school presented the projects they are involved in and the importance of literacy and bilingualism that they are promoting with the Leoescribo Project. The school was awarded with a national prize and is a model they are implementing now in the bilingual program. After the general presentation, partners observed a classroom working in corners where we had the opportunity to see mobile learning in the science classroom with AR, and how to work on projects and improve literacy. In the afternoon we visited Peñafiel Castle and the Wine Museum where we had a wine tasting session. Partners visited Safa Grial School. The head of the school presented the way they are implementing PBL and pointed out the importance of designing a good Teacher Training Plan together with a PLN and assess the pros and cons of the project. She also mentioned that it had been key the role of CFIE and the involvement of all teachers. We observed several classes to see how cooperative learning strategies are implemented in English, Math, Social Studies, Science, Computer Science etc. We also could see all the activities that made up the Roman Times project. It is a cross curricular two-year project which involves teachers, parents, students and local institutions. After the break, the last meeting took place in CFIE. All partners and leading committee recapped the main points of what happened in the seminar and gave feedback of the visits and workshops. As final task for the day, all participants completed an online evaluation form. Participants rated the objectives achieved on 1-5 scale as excellent (5). 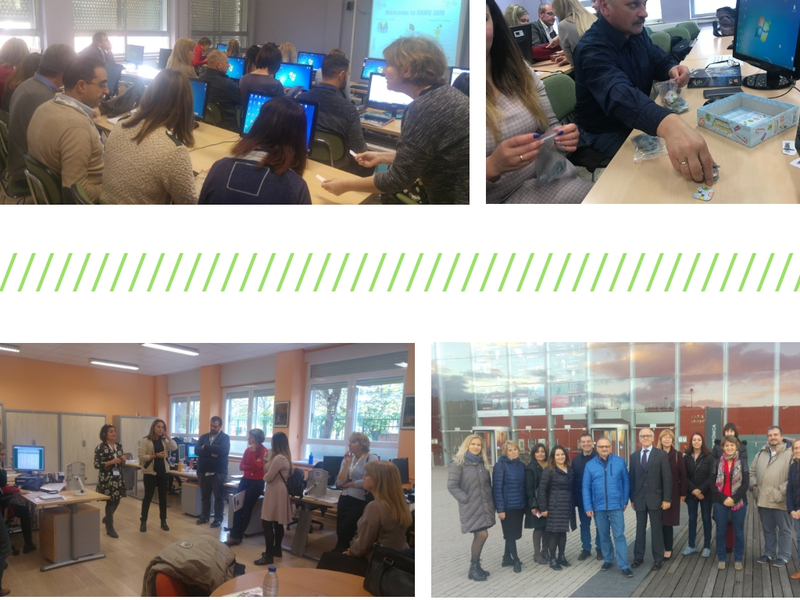 The overall expectations were met and participants pointed out that it had exceeded their expectations and found it very inspiring for the project and future collaborations between schools. to see if points of view are similar in the different institutions. to discuss some of the pedagogies used when implementing mobile learning.